Small glass jar with broad foot, three upturned handles, tall neck, and wide flat rim. The body and neck are decorated with yellow and white dragged patterns. On the neck the pattern is a zigzag; on the body a festoon pattern. 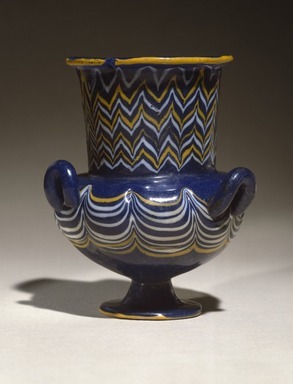 The outer edge of the rim is yellow; the remainder of the vessel is a dark blue. Condition: Large chip out of rim; two pieces glued back onto rim.